The Ringtower stands where the Ring starts, or ends, if you like, because in our days traffic is running clockwise and ends here at the Augarten-bridge. But our stroll will take us the other way, anti-clockwise, so in our case the Ring starts here. But anyhow - a ring cannot really have a beginning and an end? Oh yes, this one can. 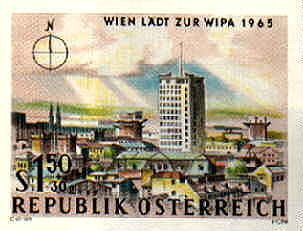 That is because it circles the old part of the city of Vienna on three sides, whereas on the fourth side the border is the Donaukanal, an old side-arm of the Danube, which takes a detour through the city of today. Well, the Stock Exchange is rebuilt since many years, but it is one of the "classic" buildings along the Ring, a pink house, on the same side as the Ringtower, or, to put it into other words, our left one. 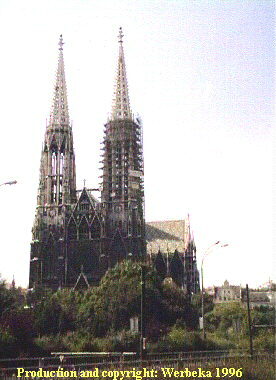 The Votivkirche with its two slender towers is one of the best-known neogothic churches in Vienna. The next spectacular view is to the right, a couple of hundred meters further ahead. A large area opens up and against the background there rise the two needlepoint-towers of the Votivkirche. Underground the tramwaylines 38 - 44 turn around, in order to restart their voyage to the outskirts of the city. The tramways leave the Ring in order of their number - anticlockwise, and there are not at all all the numbers left today. But anyhow, the system works and by learning it, you can get a better overview over public transport. On parts of the Ring itself, there run the numbers 1 and 2 and the "D", one of the last lines with a letter-denomination. Then the University follows, situated directly at the Ring, which makes it a little difficult to get an overall impression. The outside of the building is decorated with statues of important scientists, mainly from the 19th century, when the building was erected. 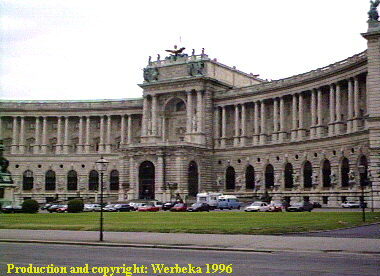 But the university in Vienna is the oldest, situated in German-speaking countries. Directly after the university there starts the Courthouse Park, which eventually gives free sight onto the neogothic Courthouse. It is a rather impressive sight and the city government is only to be congratulated, being able to work in such an inspiring environment. 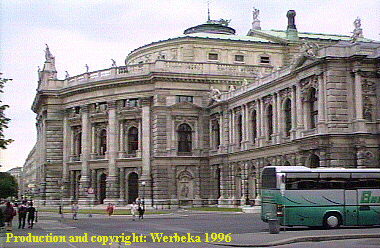 On the other, the left side again, there is the Burgtheater, Austria's most important theatre since 1776, when it was built. After the theatre there is a spacy park on this side too, the Volksgarten, which after a while changes name into Burggarten. But before we have come that far, we must look to the right again, because there is Pallas Athena standing in front of the Parliament, in the form of a Greek temple. All the buildings to our right were built at about the same time, even if there is a widespread variation in styles, attempting to cover historical architecture. This is due to the medieval City Walls, which still surrounded Vienna in the middle of the 19th century. When the young Francis Joseph became Emperor, he wanted to modernize the city. He got rid of the old City Walls and decided to build the Ring there, as the most impressive street of the city. To his advantage he could make use of the "Glacis", a large empty area in front of the City Walls, on which it had been prohibited to build anything, in order to see possible enemies storming against the city. This is how the different buildings got enough "air" around them, to make them look at their best. 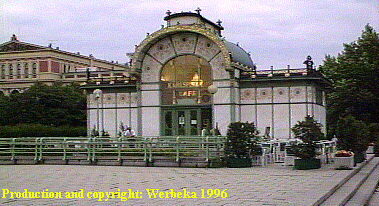 To our left we now enter the courtyard of the castle through the Heldendenkmal (=Monument of the Heroes). ...but it isn't yet a century ago, since the country was governed from here, the residence of the Emperor, the castle. The castle (=die Burg) stands there, sinister, powerful and impressive. But that was exactly what it was meant to do, in the capital of a huge Empire, consisting of many different nations and desires. The image of power surely helped to suppress one or the other revolutional mind. Today there are museums, the National Library and the Spanish Ridingschool inside of the castle. We go back the same way we entered and see on the other side of the Ring two monumental buildings, mirroring each other. In the middle of the empty space between them stands the memorial of Maria Theresa, who governed Austria a century before Francis Joseph. Maria Theresa had in spite of, or maybe because of her own sixteen children rather liberal views and founded the school system in Austria. 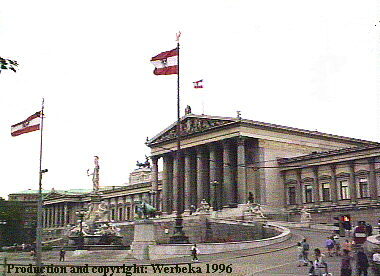 But back to the two houses: at our right there is the Museum of Natural History, at our left the Museum of Art History, both worth at least a day each of a visit to Vienna. Venus von Willendorf can be seen there, that tiny, fat image of a woman, which is more than 20000 years old. And one of the finest collections of Brueghel-paintings in the world. Among many other things. 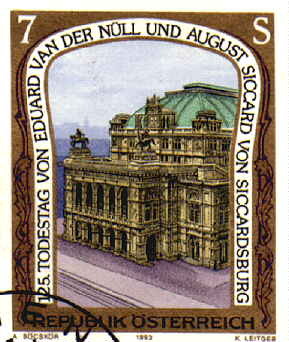 The operahouse is situated right on the Ring - this is why it is difficult to capture the entire building in one picture. At this place I propose two small excursions from the Ring. The first one leads us to the left, towards the center, passing Hotel Sacher (the one with the cake, you know), up Kärntner Straße (it doesn't really lead upwards, but everybody says so), to the real midpoint of Vienna. There is the Basilika of St. Stephan with its 137 m high tower, inside of which you can climb rather high on a narrow, winding staircase - anyway there are more than 300 steps. 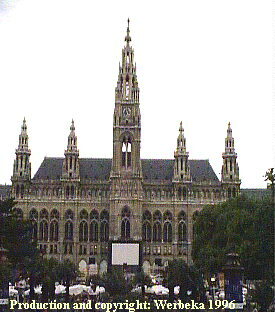 This landmark was and is the absolut centre of the city and most people living in Vienna identify their city by it. Of course it is worth to have a look even inside the church, it is impressive. In the catacombs you can see the coffins of the Habsburgs, lying there in their eternal sleep. We go back to the Ring and make a detour to the right this time. We pass the old entrance to the Underground, built by Otto Wagner in the beginning of last century, restored into its original shape - and then we gain free sight over St. Charles, the most beautiful baroque church in the city. 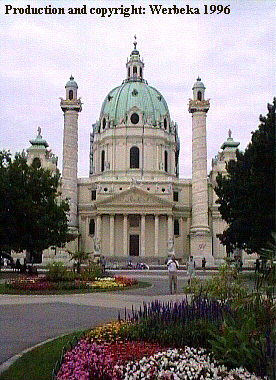 At Karlsplatz you find the old entrance to the Underground, from the beginning of the 20th century, as well as one of Vienna's most beautiful churches. Through the Stadtpark we find our way back to the Ring, where on its later part there are some of the most exclusive hotels. Take a look at the Memorial of General Radetzky to your right - my grandfather was part of the working-crew, who put it in its place. Radetzky is today probably best known through the New-Year's-Concert from Vienna, which always ends with the Radetzkymarsch, in which the audience is allowed to clap the rythm. 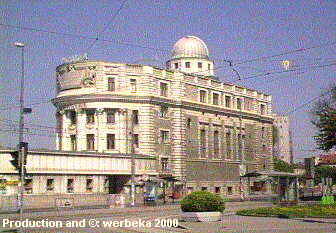 Urania, with its astronomical observatory is the last station on our sightseeing on the Ring. A couple of hundred meters further we have returned to the Donaukanal, and we see a building headed by a dome with an observatory inside. The building is called Urania, after the muse who took care of astronomy. The street along the Donaukanal, which connects our starting and our finishing point on the Ring, is very suitably called Franz-Josephs-Kai. It is, after all, because of him, that we can enjoy this marvellous street today.